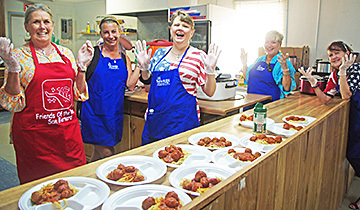 Friends of the River San Bernard assisted Sargent, Texas during their “Tournament of Heroes” weekend for wounded American veterans by cooking a spaghetti dinner for 300 on Friday, June 10 at the Sargent VFW hall. 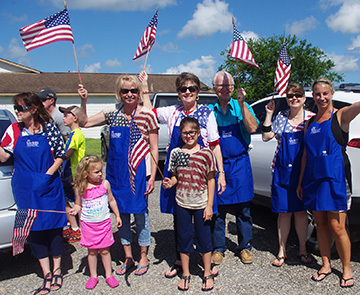 Sargent residents opened their homes for the weekend to host wounded American Veterans. 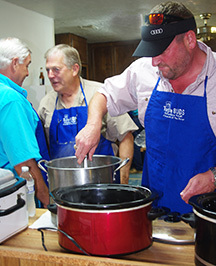 Local businesses and volunteers provided main meals and local residents and area fishing guides donated an all-expense paid day of fishing so Wounded Warriors may participate in the event. Seventeen friends of the river, who volunteered to fix the spaghetti dinner, were Wayne & Vicki Head (headed up the group), Gera Martin, Lohn & Karen Zylicz, Mike & Suzanne Goodson, Fred & Nancy Kanter, Bob & Susan Bailey, Cathy MacDonald, Tom & Ange Ronayne, Janell Keith, and Ken & Linda Wright. The FOR kitchen crew waves flags to welcome the wounded American Veterans arrival at the Sargent VFW for their weekend of fishing. Men say a women’s place is in the kitchen, just remember, that’s where all the knives are. Left, Vicki Head, granddaughter Kenlee, Bob Bailey, Susan Bailey, Cathy MacDonald, and Janell Keith. “Which pan to use?” is the question Wayne Head ponders. 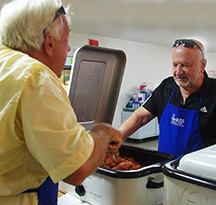 Bob Bailey explains the task of rotating the meatballs to observer Fred Kanter. 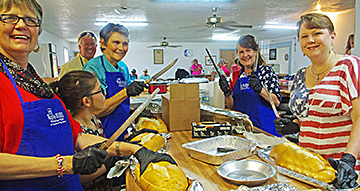 Trying not to cut the electrical cord, Karen Zylicz slices bread. 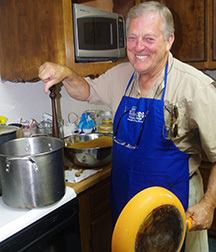 Ken Wright is busy at the sink washing dishes. Lohn Zylicz mans the meatball transfer as he skillfully does not drop any on the floor. President Mike Goodson discusses "al dente" with Wayne Head. 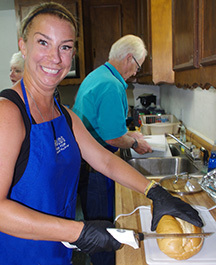 Raising their institutionally chic gloved hands in unison, FOR volunteers signal that the cooked spaghetti is on the plates and ready-to-eat. >> Left, Suzanne Goodson, Karen Zylicz, Janell Keith, Nancy Kanter, and Kathy MacDonald.